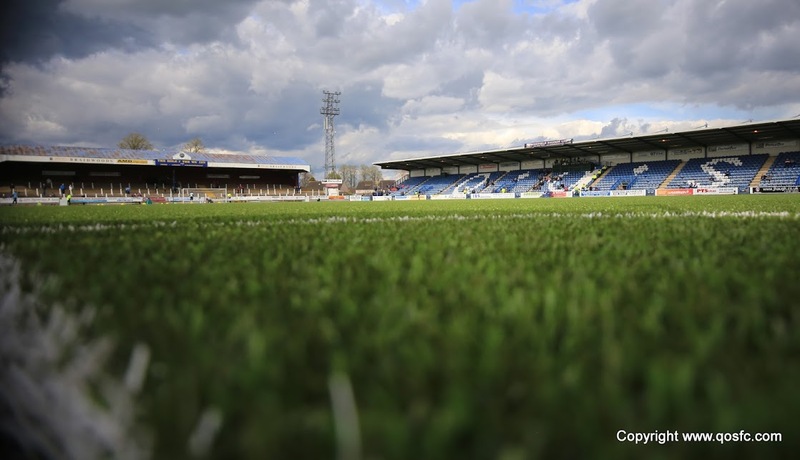 With Mark Durnan missing the game due to suspension, Queens boss, James Fowler, re-shuffled his defence with Andy Dowie moving to centre back alongside Chris Higgins, and Lewis Kidd moving to take Dowie`s place at right-back. The midfield berth vacated by Kidd allowed recent signing, Mark Millar to make his full debut, whilst on the bench, Chris Mitchell returned to the matchday squad for the first time this season, and 16 year-old, Jack Dickinson, also found a place on the subs bench. Queens started brightly and after only 3 minutes of the game, they almost went in front. Ian McShane`s corner on the right was whipped into the near post, and with the Hibs defence only partially clearing the ball, Iain Russell was very unlucky to see his precisely placed effort crash against the junction of bar and post. That would have been a great start for the hosts, and they took plenty of confidence from that opening as they continued to force the play. A good move down the right sent Danny Carmichael racing clear, and after twisting and turning his opponent, his pass inside to Ian McShane saw the midfielder go very close to opening the scoring, but his first time curling effort was only just off target. 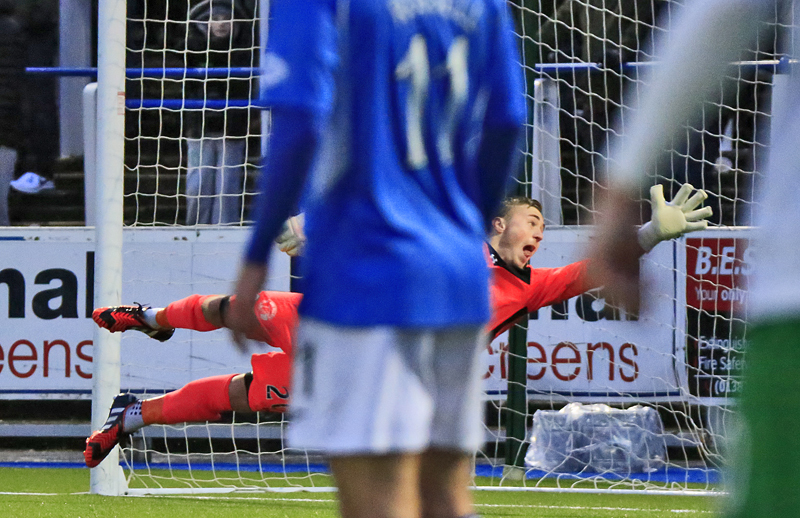 It had been McShane who scored the only goal of the game when the sides met at Palmerston earlier in the season, and he was not so very far away from doing so again. Although the visitors had been neat and tidy in their build up play- maybe sometimes over playing- it took them 18 minutes before they put the home side under any sort of pressure. After forcing two corners in quick succession, they almost profited from an error of judgement by Queens `keeper, Jim Atkinson. Following the second set-piece, the ball was eventually worked to Craig on the edge of the box, and although his shot was blocked by the challenge of Higgins, the ball looped high towards the Queens goal, and with three Hibs players bearing down on him, Atkinson was momentarily distracted and spilled the ball, fortunately though, Lewis Kidd was well placed to clear and the danger was averted. The front pairing of Cummings and Boyle were slowly starting to get into the game as the visitors passing game began to click, and good link up play between the two created a good opportunity for Cummings, but he was deemed to be offside as he raced clear of the Queens defence. Cummings was soon to be involved in the action again, when following the award of a free-kick to Queens he became the first player to be cautioned by referee, Murray. Whether or not it was for not re-treating the correct distance, or for handball was not clear, but following the re-take Queens almost scored. McShane`s ball into the box was met by the onrushing Kevin Holt, but his powerful header was too straight and flew well wide of the target. Mark Millar almost got his home debut off to the best possible start, when following a free-kick that was cleared to him on the edge of the area, he controlled well, skipped past a defender and drove a decent effort straight at `keeper Oxley. The visitors then had a really good chance to take the lead seven minutes from the break. A corner from the right was met by Fontaine and his goal bound header was cleared off the line by McShane covering well on the far post. Up until that point it looked as though set-pieces, and in particular corner kicks,would be the best way for either side to find a breakthrough, although during the final moments of the half, the visitors carved out three really good opportunities to take the lead. Firstly Craig got in behind the Queens defence on the left and after showing great skill to control the ball on the move, his shot across goal was never going to trouble Atkinson. Minutes later Cummings got to the bye-line again on the left, and although his pull back rolled nicely into the path of Craig, his shot from 8-yards out sailed high over the bar. Then with just about the last shot of the half, Boyle latched on to a loose ball firing his shot from the edge of the area only a few feet wide of the far upright. The visitors had certainly ended the half on the front foot, but for the most part, the half had been a pretty even contest and the crowd of 3677 had witnessed a decent half of football. The same 22 players began the second period and the first incident of the half saw strong appeals for a Queens penalty. The ball was driven into the penalty area and although the ball did hit the hand of a Hibs defender it was one of those difficult decisions to make, and this time referee, Murray decided in favour of the Hibs player. As the tempo of the game quickened, the midfield duo of McShane and Millar were gradually falling further back, and as such, the Hibs midfield of McGeouch, Craig, Robertson, and Allan were starting to have more meaningful possession. 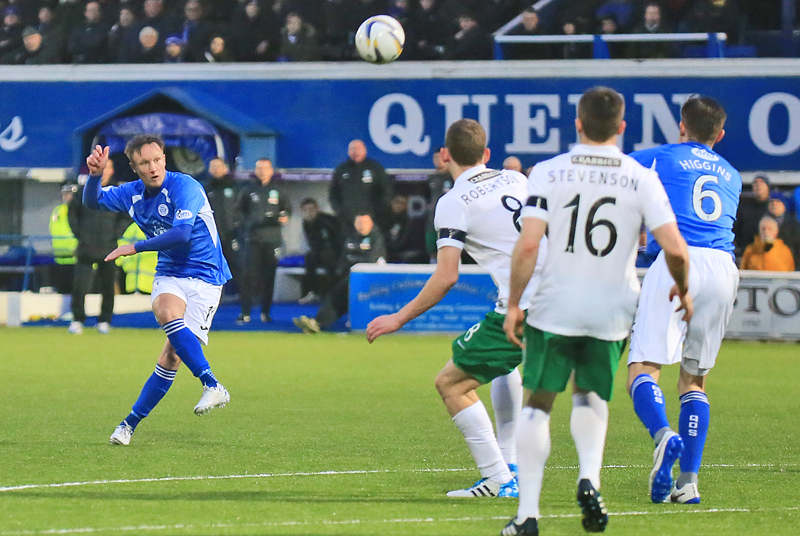 With both Allan and McGeouch roaming all over the pitch, Queens were finding it difficult to contain them, and as a result, the visitors began to run the game. Mark Millar was cautioned as he broke up a quick Hibs break with an illegal challenge in midfield, and as the play developed following the free-kick, Cummings wasted a decent chance when well placed just 10-yards out. 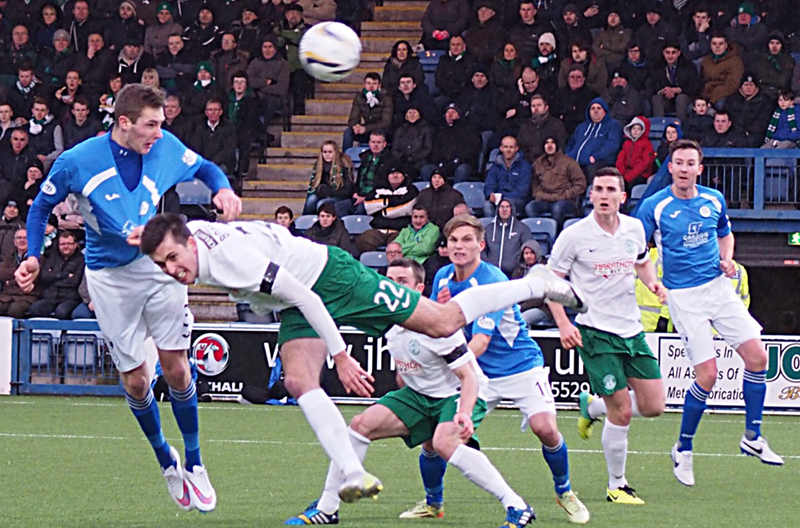 The majority of the action was now in the final third of the Queens half as Hibs continued to press for the opening goal. The Queens support were feeling the nerves and Atkinson almost added to their feelings after needing two attempts to prevent the ball going beyond him following a corner. With the pressure mounting on the home defence, it probably came as no surprise to see the visitors take the lead. 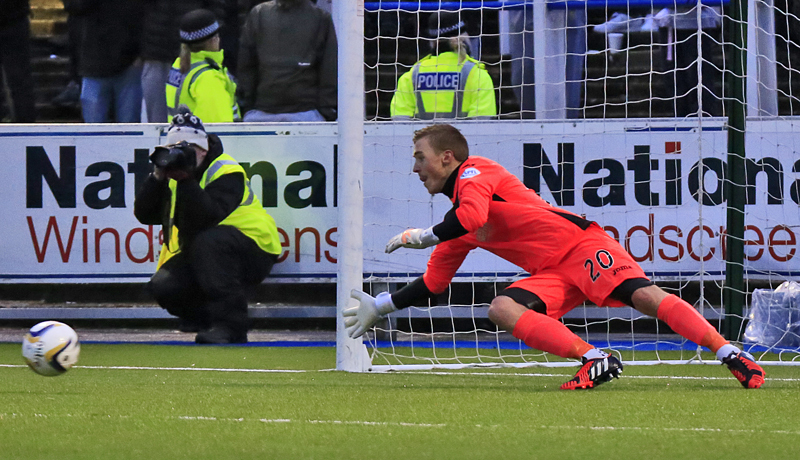 A delightful through ball from Allan split the Queens defence and as Cummings latched onto the pass and tried to round `keeper Atkinson, the young Queens shot stopper brought him down to concede what was a clear penalty. The impressive McGeouch slotted the ball home confidently, and although Atkinson - who was booked for the foul - dived the right way, the penalty was precise enough to beat him. The hosts tried to respond, and a through ball from Carmichael almost picked out Gavin Reilly, but the greasy surface saw the ball carry through to the `keeper before the Queens striker could latch on to the pass. 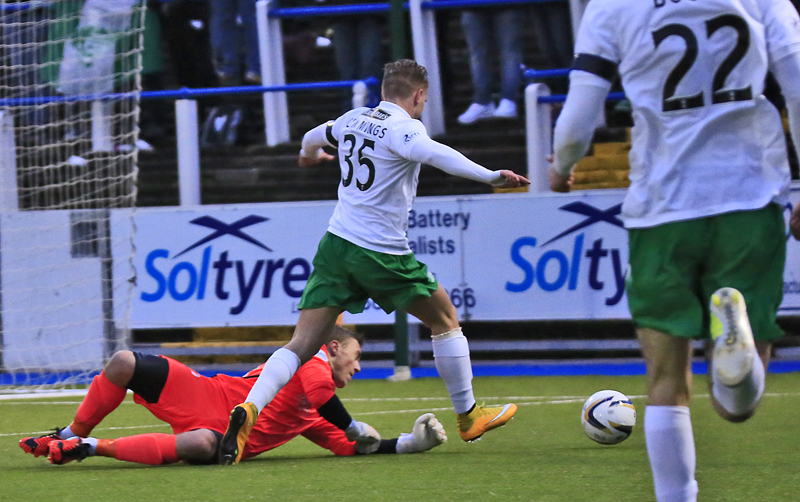 At the other end the Queens defence was carved open again as McGeouch and Allan combined well to set up Boyle, but under pressure from Dowie`s strong challenge, his effort struck the near post. That was close to being a second goal for Hibs, but the travelling support didn`t have to wait much longer to cheer what was the clinching goal. With twenty minutes to go, Queens introduced Michael Paton for Derek Lyle, but just three minutes later, Queens fell further behind. A promising move down the right ended with the ball being played back into the path of Robertson just outside the penalty box, and his curled attempt flew past Atkinson - a well executed finish- that all but wrapped up the points for the visitors. New signing Mark Millar was replaced by the returning Paul Burns for the final 13 minutes of the contest, Millar`s first start showed signs of promise, good awareness and good use of the ball, although obviously match fitness will improve with time. Queens final change saw young Jake Pickard replace Ian McShane with 8 minutes left, and as the game drifted towards it`s conclusion, a shot from Iain Russell from outside the area finished well wide of the target, and that on a disappointing day for Queens pretty much summed up their afternoon. 4 min And Russell hits the corner of bar and post from the edge of the box! 16:55 Dissapointing result but not a bad performance. Hibs had the better of the second half and probably deserved their win.